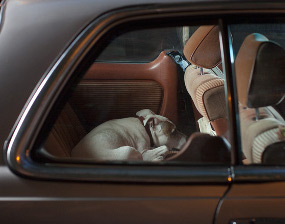 Usually this happens when an animal is left in a hot car. Immediately move the animal to as cool an area as possible, such as a shady spot under a tree. Sometimes the best place is simply the car’s shadow, if there is nothing better nearby. Pour water on the animal. Apply as much of a continuous flow as possible. Place ice packs or cold, wet towels around the animal’s head and body, and get to a veterinarian as soon as possible. Give one dose of Belladonna 30c. If you see no signs of improvement after thirty minutes, give one dose of Glonoine 30c. Follow with Dr. Bach’s rescue remedy, if you have it, putting two drops in the mouth every ten minutes until you reach the veterinarian. If breathing stopped, follow the procedures described in the Artificial Resuscitation section.